NEA Career & Tech Center serves students from 13 school districts in four Northeast Arkansas counties​. We strive to instill in every student the skills necessary to compete for high demand, high wage earning careers in order to lead successful lives in the ever-expanding global marketplace. Jonesboro - NEA Career & Tech Center is set to host the first annual Arkansas HTEC (Haas Technical Education Center) Educators Conference. This event is sponsored by HFO Phillips and will be held March 28th from 7:30AM until 3:00PM. Attendees are invited to network and meet other instructors, administrators and advocates in the field of Advanced Manufacturing. Instructor forums, partner presentations, manufacturing and higher education panel discussions are scheduled. Registration and continental breakfast begins at 7:30AM. Lunch will be provided and door prizes will be awarded at the conclusion to the conference at 3:00PM. For more information, visit http://htecnetwork.org/conferences.cfm or contact Anna Smith at annas@phillipscorp.com. Jonesboro - October 4th has come and gone at NEA Career & Tech Center with the first ever Manufacturing Day event held on campus. And if the reactions from speakers and attendees are any indication, this will indeed grow to become quite an annual event. Industry speakers included Kenneth Jenkins, Martin Sprocket & Gear, Jennifer Morgan with Trinity Railcar, Camfil APC's Sandy Hogan and Brian Richardson, American Railcar's Mike Peters and Truitt Dowdy with ARDOT. Several other industries attended including representatives with Arkansas Glass Container Corp., NEA Hydraulics, FMH Conveyors and Phillip's Corp.
NEACTC alumni speakers opened each shift to inform guests of their progress since graduation. All attendees are attending college, training school and working in local industry. Each noted how NEACTC had played a critical role in their lives. "I was ready to quit school until I enrolled in the H-VAC program," said Carolina Robles, now attending ASU-MT and employed as an HVACR technician while she finishes her final two semesters of college training in HVACR. "It truly changed my life." Refreshments for each of the three shifts were catered by students enrolled in the NEA Career & Tech Center Culinary Arts program. Lunch was also catered for all industry partners and alumni speakers. Student demonstrations were held in four programs: Advanced Manufacturing (NASA HUNCH CNC machining, laser engraving, 3D printing & design), HVACR (soldering & brazing techniques, electrical circuit wiring w/ thermostats & switches), Welding Technology (creating a complete product--cell phone holder in five minutes), and Industrial Technology (Amatrol lockout/tagout procedures on student fluid power trainers). Jonesboro - Auto Collision Junior Chandler Allison has acquired numerous skills--and now, numerous tools at NEA Career & Technical Center. 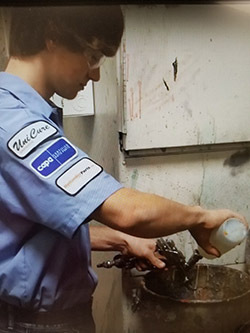 Jeff Smith, NEACTC Auto Collision Instructor, was recently notified that Chandler's video entry was one of the winning entries in the Lincoln Tech/MATCO High School Video Contest & Tool Box Giveaway. Chandler will receive a MATCO Toolbox with a starter set of MATCO tools valued at $1700. NEACTC is also a big winner in the contest. The Tech Center will receive a professional grade MATCO master work station and tool storage unit for the Auto Collision program valued at $21,000. Recently, Chandler discussed submitting an entry with his AC instructor, Jeff Smith. So, Chandler and Smith approached Steve Carson, NEACTC Advertising, Graphic Design & A/V Film instructor. Carson pitched the idea to Wendy Cazares, a senior enrolled in Carson's course at NEACTC. Wendy shot and edited a short video production as Chandler proceeded to explain how career and technical education has impacted his life and how this will impact his plans for the future. And as they say, the rest is history. 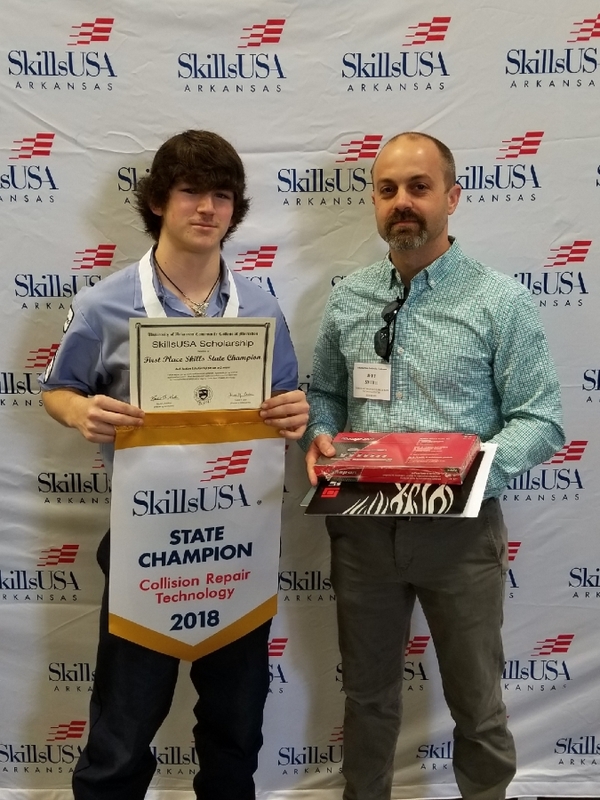 Chandler is enrolled at Paragould High School and incidentally, has had quite a junior year at NEACTC, winning the state championship in April in Collision Repair Technology at Hot Springs during statewide Skills USA competition. Wendy, a Jonesboro High School senior, also co-produced another award winning 30-second public service announcement video earlier this year. Her submission captured third place honors during the February statewide month-long career and technical education awareness month. Congratulations Chandler--and Wendy--for your outstanding work and for representing NEA Career & Technical Center in such a professional manner! Special thanks to MATCO Tool and Lincoln Tech as well. Little Rock, Hot Springs - Results are in and celebrations continue at NEA Career & Technical Center in Jonesboro. While Health Science Technology students returned with numerous awards from state HOSA competition in Hot Springs, students in all other NEACTC programs of study continued their preparations for competing at Pro Start and Skills USA. And needless to say, it was quite a successful year as students from seven programs of study walked away with the hardware--literally. Students earned a total of 29 state medals. Nine students won gold, seven won silver, and an additional thirteen walked away with bronze awards at state. After tallying the results, NEACTC Director Eddie Crain stated, "This has been a phenomenal year for student achievement. I am very proud of our students but none of this would be possible without the dedication of our instructional staff guiding and teaching those students." Crain noted that it is critical that Arkansas Career Ed officials ensure competitions are held in all content areas so that secondary technical center students have a venue to showcase their skills. "This year we have a new program of study in Industrial Maintenance created to meet the demand of NEA industry. Although there is national competition, none was held at the state level in critical areas. Students from our IT program had competed at Burdette in early February and after just four months of this course of study, students won 2nd and 3rd in regional mechatronics competition. Therefore, we have reason to believe those students could have been successful competing at the state level--IF there had been competition held in mechatronics. Nonetheless, it was an amazing year for our students and I could not be more proud of everyone involved," Crain stated. At the Burdette and Blytheville regional competition February 2nd, an additional seven NEACTC students earned competition medals. Three NEACTC programs of study competed with each program of study earning medals. An NEACTC student earned gold in Early Childhood (hands-on), the HST team won silver in the Medical Professions Quiz Bowl, and two IT students earned medals, with one each in silver and bronze. At Little Rock, the four-member team representing NEACTC Hospitality and Culinary Arts each earned bronze medals and a total of $48,000 in scholarship offers for their efforts. A hearty CONGRATULATIONS to NEACTC staff and students for your 2018 efforts! To learn more about individual winners, competition and misc. photos, visit the official NEACTC Twitter site @NEACTC1. Blytheville and Burdette - NEACTC students brought back the bacon recently while competing at Arkansas Northeastern College. Actually, students brought back a first place trophy, a first place gold medal, five silver medals, and a bronze medal. It was the first time that NEACTC students had participated in the competition known as the TOPS Challenge. Students from northern Arkansas and southern Missouri made the trip to take part in the competition. NEACTC Director Eddie Crain stated that he appreciated the opportunity to work with ANC. "As I stated to Gene Bennett of ANC during the awards presentation ceremony at Burdette, we can accomplish much more when we work together." Crain said that he also appreciated Sherri Bennett (ANC Director) and Michelle Bennett (ANC Assistant Director) for allowing NEACTC students the opportunity to compete. At the Blytheville campus, the team of Sydney Wood, Karen Lopez, McKenzie Wilson and Anthony Canizales (JHS) captured silver in the Medical Professions Quiz Bowl. Team sponsors are RN's Lynn Wolfe and Gina Cornish. 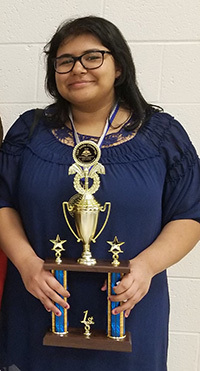 NEACTC student Esperenza Ruiz (Riverside) captured gold and a first place trophy in Early Childhood Hands-on. She is enrolled in Ricky Barker's Advanced Manufacturing class. Industrial Technology students Chandler Tate (Riverside) and Collin Ryan (JHS) placed in mechatronics. Chandler won silver while Collin picked up the bronze medal. The Industrial Technology program of study is in its inaugural year at NEACTC. The program is taught by Johnny Tierce and was created after nearly 18 months of collaboration with business and industry partners, the Jonesboro Regional Chamber of Commerce, and both NEACTC and JPS administrators. A partnership team was thus created, which visited several sites around the state as the program was under development. Congratulations to NEACTC students and instructors for a job well done! NEACTC Partners With Arkansas State Univ. Jonesboro - NEACTC and Arkansas State University are partnering to offer concurrent credit through A-State in Computer Repair, Networking, and Security. The course is being co-taught by Brent Wheaton of Jonesboro and Dr. Russell Jones of A-State. The agreement was inked in December after multiple discussions. "Actually the idea to offer concurrent credit came from Dr. Russell Jones, Chair of the Accounting and Computer Information Technology Department at Arkansas State University. Dr. Jones is on the combined advisory board for the Computer Repair, Mobile Apps, and Drones programs and stated that he would be willing to offer concurrent credit in our Computer Repair and Mobile Apps programs of study," noted NEACTC Director Eddie Crain. Jones made the comments while attending the fall advisory board luncheon held at NEACTC. The rest is history as the story goes. This spring, students holding a high school GPA of 2.5 and either an ACT Aspire 428 reading score or an ACT composite and reading score of 19 each are eligible to enroll through Arkansas State University for concurrent credit. Students will receive three hours of college credit in CIT Telecommunications and Networking for successfully completing the course. Students also receive up to three hours of high school credit at the same time for its successful completion. Crain noted the benefits of concurrent credit in the course. "Students will have several options with concurrent credit. The hours can likely be used as elective hours if students decide to major in something other than Information Technology and also, if they enroll at another university, more than likely the credits are transferable between higher ed institutions." This fall, students meeting A-State eligibility requirements in the Mobile Apps program of study at NEACTC will be eligible for concurrent credit as well. Details are being formalized. 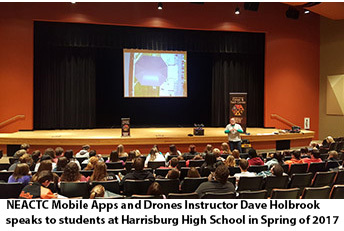 A-State's Dr. John Seydel may co-teach the coding class in conjunction with Dave Holbrook, who also teaches drones (UAS) at NEACTC. Students have an additional benefit to enroll in the Mobile Apps and Computer Repair classes at NEACTC as well. High school students can earn their computer science required credit by passing either Mobile Apps or Computer Repair at NEACTC. Jonesboro - NEA Career & Technical Center has posted gains in student enrollment for the fourth consecutive year. NEACTC Director Eddie Crain notes that, "It takes effort from every single member of our staff and the cooperation of our partner school district administrators for continued growth in our enrollment." Crain attributed growth to partner schools that send their students by grade level to the center for spring tours. "Those students are usually amazed at the opportunities that exist at our center." Faculty and staff at NEACTC also does an excellent job in promoting the merits of their individual programs of study during those tours. And, it really helps when our partner schools, "Open up their gyms and auditoriums so that our staff members can begin the process of recruiting their students with a look at what is offered at NEACTC." Student Affairs Counselor Sherry Bookout says that she truly appreciates area counselors collaborating with her to provide opportunities for area students to attend the center for specialized training. "They work with me to set tour dates, they help me arrange times when Mr. Crain and I come to their schools to speak to their students, and they really spend time to schedule their students so that they can attend our center. I think we all work together extremely well. And, it really is appreciated." NEACTC serves students attending from four Northeast Arkansas counties representing 13 area school districts: Bay, Brookland, Buffalo Island Central, Greene County Tech, Harrisburg, Hoxie, Jonesboro, Nettleton, Paragould, Riverside, Valley View, Westside, and Walnut Ridge.